Have you ever lost weight and gained it back? You’re not alone: that’s what happens to most dieters. 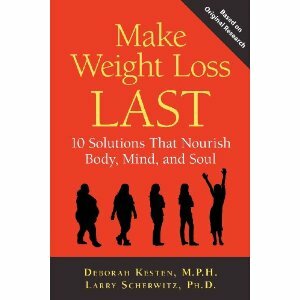 Obesity researchers Deborah Kesten’s and Larry Scherwitz’ new book Make Weight Loss Last reveals there’s more to being a successful loser than eating less and exercising more. Tasty or not, fast food full of added fat, sugar, and salt; and greasy, fried fare, are two of the key causes of weight gain. To turn the tide, you have to choose fresh whole food in its natural state as often as possible. Make lots of fruits, veggies, whole grains, beans and nuts and seeds your most-of-the time way of eating, with lesser amounts of lean fish, poultry, meat and dairy. Although dieting, judging food as “good” or “bad,” anxiety about food, and thinking a lot about the “best” way to eat may not seem to have much in common, they are all characteristics of a “food fretter,” and increased odds of overeating and weight gain. To get off the food-fretting treadmill, perceive food and eating as one of life’s greatest pleasures. Choose wisely and enjoy it. Give up eating while doing other activities—such as working, driving, or watching TV. Stay mindful, keep focused, and do one thing at a time. Stop working and don’t eat at your desk. Don’t read while you eat, don’t watch TV while you eat, and don’t drive while you eat. Instead, eat when you eat. Stop yourself from eating to soothe negative emotions or out-of-control food cravings. “Emotional eating” is the #1 predictor of overeating and weight gain. To get control, pause and pay attention to your feelings. Get in touch with your feelings before, during, and after eating. Make a conscious choice to eat for the pleasure. Eat when you have a healthy appetite and don’t allow yourself to get too hungry. Experience feel-good emotions when you eat and enjoy yourself. Eat alone less, eat with people more often. Eating alone can promote overeating. Snacking secretly is one obvious source of needless calories. When it’s time to eat a meal, invite others to join you at your table. Sharing mealtimes with friends, family, or coworkers will help keep you from overeating. Think about the atmosphere in which you’ll be eating ahead of time. Both the psychological and the aesthetic surroundings when you dine can influence overeating and your weight. To reap the rewards, each time you eat, design your own dining experience by creating an emotional and physical atmosphere that’s as pleasant as possible. Your senses have an amazing impact on your appetite and weight. Slow down and pay attention to the food before you through your eyes, ears, nose, and taste buds. Look at and notice the colors, the smells, the aromas. Pay attention to the look, the feel and the texture of the food. Appreciating food through your senses wards off overeating. Think about the food, where it comes from, and how it got to your table. Develop more appreciation in your heart for the food before you. Obesogens are the manmade chemicals—plastics and pesticides—which have found their way into our food supply and beverages. They wreak their havoc on weight by mimicking estrogen, a hormone that can make you fat. The solution? Just say no. A key way to avoid consuming “chemical cuisine” is by staying away from bisphenol A (BPA) found in canned foods, bottled beverages, meat packed in plastic, and more. Getting enough sleep is a key ingredient in managing weight. If you sleep less than five hours a night, the odds of your becoming obese is upped by 73 percent! Just an hour more decreases the amount of ghrelin, a hormone your body produces that can cause weight gain. Better yet, get 7 hours of sleep every night to protect yourself from the sleep less-weigh more cycle. Burning calories and speeding up your metabolism with physical activity helps you stay slim. Exercise also nourishes your body, mind, and soul with a flood of feel-good feelings produced by naturally occurring hormones. To optimize weight loss, exercise in the morning when your body is more likely to burn fat for energy. Keep workouts to 45 minutes or less to lower the odds of producing cortisol, a stress hormone that can activate body fat. You can change the way you think about dieting, losing weight, and keeping it off. It works because you focus on the underlying reasons you overeat and gain weight, as well as the solutions you need to turn overeating into optimal eating. The end result: attain and maintain optimal weight…for life.